Have you ever heard about any mobile available in just rupees 251, if you don’t believe in it then this is the time to believe. The Freedom 251 is launching in India on 18th Feb 2016 and the mobile Phone will be available for customers at Freedom.com from 6 PM. Registration process is very simple. Visit the freedom251.com from your web browser or Mobile Device. Give the information in proper format. Ringing Bells Freedom 251 Mobile Specification. 1. It is a 3G Phone. We cannot confirm that this mobile will available on major shopping site like Flipkart, Amazon, Ebay Snapdeal or any other shopping site. 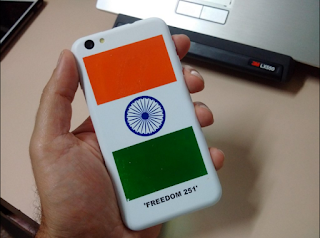 The company is directly selling the mobile phone thru registration process, therefore registration is must to purchase Freedom 251 Mobile Phone. The company set Price range of Rs 251. The Govt is giving this phone at lower rate. Simply visit the site on 18th Feb 2016 at 6.00 AM and register yourself for the Mobile Phone.